Walking from the Durham Ox to the west end of North Gate and back into Bath Street …. 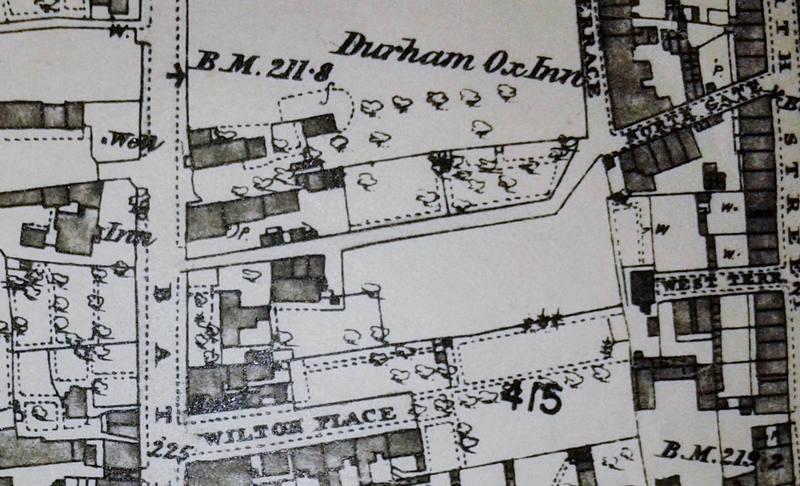 You can see the Durham Ox Inn at the top right of this map (c 1880) … we walk along North Gate, east to west (right to left) and arrive at Bath Street. The Inn we can see opposite us is the Poplar Inn which we will visit later. As we came out into Bath Street, on the southern corner of North Gate is the house of Moses Mason. Winter was a very dreary time; the streets were unlighted, and the shops were dark and gloomy. Very few people went shopping after dark. When pedestrians were abroad on the dark nights it was customary for them to take a lantern with a tallow candle inside to light them on their way. The church and chapels were lighted by candles. The two candelabras that held the candles in the old Cricket Ground chapel were hanging there until a few years ago. When evening drew on, the children were kept indoors, candles were lighted, snuffers and tray placed on the table and the family gathered round it. The boys would be reading or playing some game, the girls would be sewing a long seam or knitting. If a family were fortunate enough to possess a piano (we had a table piano) it helped to pass the time more pleasantly. Moses Mason, the tallow chandler, lived in a picturesque old house, standing on the bank, with its grass plot in front. In 1871 this ‘picturesque old house’ was at 80 Bath Street. The business had descended to Moses and his sister, who assisted him, from their father, Moses Mason, senior, and grandfather before him. ‘Grandfather Mason’ was Jabez Mason, a flax dresser, who married Mary Turton in 1772 and their son Moses senior was born in 1788. The latter married Mary Dodson, eldest child of William and Rebecca (nee Hodgkinson) in May 1813 and the couple had at least one child, Elizabeth, before Mary died in February 1816, aged 28. In April 1821 Moses remarried to Sarah Lings of West Hallam, daughter of Joseph and Elizabeth (nee Marshall). Son Moses junior was one of their (at least) eight children. Writing of the candle trade brings to my mind the story of old Tunnicliffe, the Parish Clerk. This sermon referred to by Adeline must have been in or before 1836, the year of Richard Moxon’s death. Born in Pontefract, West Yorkshire the Rev. Richard Moxon, formerly Curate of Drypool and Sutton, Hull, was Curate of Ilkeston from 1823 until his death on Good Friday. “All the Parish loved him: Chapel as well as Church people. He was poor in pocket, but rich in Christ”. Richard was fondly remembered by ‘Progress’ in the Ilkeston Pioneer (IP April 1853) …. ‘Is there a single individual in Ilkeston who can say aught disrespectful of that excellent man ? I, and very many others, have much to be thankful for to him.The pains he took to assemble us on the Sunday afternoon, to explain to us the scriptures; the benevolent smile he gave as we vied with each other in answering the questions he put, were more than enough to repay us: and he , I have no doubt, has his reward’. In November 1833 Moses Mason senior was declared insolvent and then bankrupt at the end of that year. In January 1834 his bankruptcy was annulled. When he died in 1848 his widow Sarah assumed responsibility for the business, helped by their son Moses junior and his sister Sarah junior. In 1852 Moses junior married Mary Ann Wilcoxson, the daughter of George and Sarah (nee Lings). At least ten children followed. In February 1865 Mary Ann discovered that a petticoat had been stolen from her clothes’ line and after having reported its loss to the police she perhaps gave it up for lost. A short time later however, journeyman cabinet maker William Thomas Norman, an employee of Bath Street cabinet maker David Pressland, was seized while trying to steal two flannel petticoats from a similar line at the beerhouse of James Aram in Derby Road. After his arrest and imprisonment his lodgings in New Street were searched and eight more petticoats were discovered….two belonging to Ann Potter of Park House, two to Mrs. Meakin of Burr Lane, one to Mrs. Bostock of Bath Street and the one belonging to Mary Ann. Two final two petticoats remained without a home, not having been reported stolen like the rest. When the police visited William Thomas’s wife, living in Nottingham, further petticoats were discovered while others had been pawned. The number of stolen undergarments totalled 18. At his subsequent court appearance the cabinet maker said that he couldn’t explain why he took the petticoats but that he could not help doing so. The magistrates were of the opinion that he was ‘of weak intellect’ and so sentenced him to six months imprisonment instead of two years as they might otherwise have done. Candle making in those days was a very profitable business, as everybody used candles. Oil coming into use made a great difference to Mason’s. As far as Ilkeston was concerned candle making became a dead letter, and Mason’s had to depend upon the outlying villages for their trade. In the early 1860’s a small paraffin lamp came into use — it had a metal container holding half-a-pint of paraffin. This was an improvement on the candles. Later on larger lamps with glass containers came along and the long, dark evenings were passed more pleasantly. It was not until oil lamps came into general use that shops and houses began to be illuminated with them instead of the long and short eights, sixteens and twenty-fours, the name given to the candles in use at that time. “Then (candles) mysteriously disappeared and the miner went to work with a curious little lamp in his hand. This was the safety lamp ordered by Act of Parliament. Then the spread of gas lighting , and lastly the invention of the paraffin wax candle, put an end to the tallow candle trade. It had been the cause of endless snuffing for generations and now it was snuffed out itself for ever”. Mason’s Candle Factory was behind what were later Melia’s food store premises in Bath Street; these were on the upper (south) corner of Northgate Street as it joined Bath Street. At times Charles Tantum, butcher of South Street, would set aside some of his animal fat for Moses to use. Writing in 1892 Enquirer remembers going to Moses’s premises ‘one Saturday in the summer with Joe Bates to take some fat from his father’s butcher’s shop, and of the smell of tallow I got a surfeit, and could smell nothing else for a week’. Joe Bates was a son of Hugh and Anne (nee Harrison) and when his father died in 1839 his mother married butcher Charles Tantum in the following year. Writing in the Advertiser of 1933 and recalling his early life in Ilkeston, Richard Benjamin Hithersay (RBH) remarked that on certain days passers-by would “encounter a most intolerable stench emanating from the ‘factory’ where a Mr. Mason boiled the evil-smelling fats from which the tallow candles, blue and white, were compounded. After 60 years, the memory of that villainous odour lingers with me still”. Moses junior died in Brussels Terrace in May 1891, at a registered age of 61, although it should have been 63. At that time he was no longer a tallow chandler but was a scavenger for Ilkeston Corporation. The ten children of Moses junior and Mary Ann. Mr. Mason’s eldest son, Moses William, married Miss Emma Maltby, sister to the late Mr. Charles Maltby, of Dalby House. Moses William was the first child and he was to marry Emma Elizabeth Maltby, daughter of lacemaker Joseph and Mary (nee Barker) in August 1875. Until the end of the century he traded in Bath Street as a grocer. Sarah Jane (Janey?) died at the Bath Street home in October 1879, aged 23, “after a lingering illness”. …. and Lizzie left Ilkeston. ‘Lizzie’ was Eliza Mason born in 1858. John Lings was born in 1860 and by the end of the century was living unmarried in Sheffield, employed as a draper’s assistant. Anne Mary was born and died in 1863, aged 5 months. Harry died in May 1865, aged 10 months. George Arthur was born in 1866, and later moved to Lancashire where in 1890 he married Eliza Maria Bennett Warne. By the end of the century he was at also at Sheffield working as a journeyman baker. Mary was born on Christmas Eve of 1868 and died one month later. Edith Annie was born in July 1871 and in 1898 married newspaper organiser Thomas Lewis Warne, brother of Eliza Maria Bennett Warne. The couple then went to live in Leeds. Florence Mary, born in September 1873, married file hardener Ernest Keyworth Rolley of Sheffield in 1896 and thereafter lived in Sheffield.